There’s been a strong likelihood that Avengers: Endgame will clock in at around 3 hours for a while now, as discussed by Kevin Feige, but it wasn’t until this week that the movie was officially listed as such. On Monday, AMC Theaters updated Endgame‘s runtime on the website to 3 hours and 2 minutes. That seemed like confirmation of the film’s length, but Marvel and Disney have yet to comment on the matter. Although, it looks like they don’t need to, as Thanos himself, Josh Brolin, recently shared a fan’s post about the reported runtime on his Instagram Story. The actor didn’t say anything about the length at all, but we can presumably take the fact that one of the film’s stars has shared this runtime as a sign that it’s the real deal. 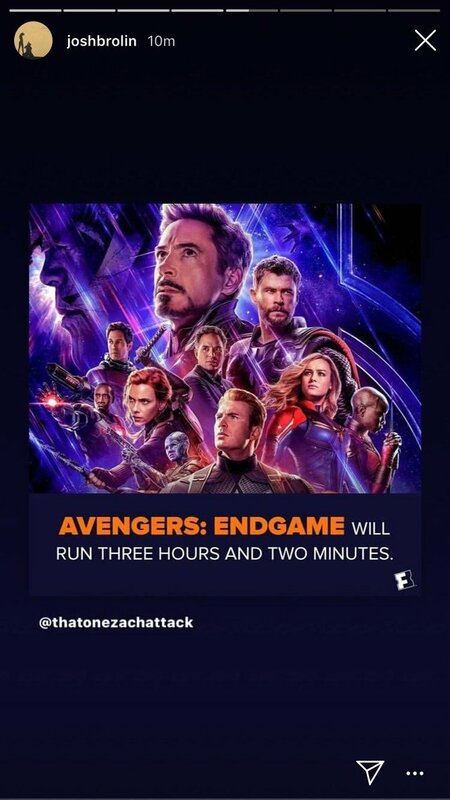 Since it was first rumored that Endgame could run for 3 hours, fans have debated whether that’s a good idea or not, with it even suggested that the movie should have an intermission. Some believe this might be too long, but others are willing to trust that Marvel know what they’re doing and are ready to be entertained for three full hours plus change. After all, plenty of major blockbusters have had hefty runtimes, most notably the Lord of the Rings films, and everyone lapped them up. The Russo brothers revealed a couple of months back that they were working with a 3 hour cut of the movie and at the time, they explained that, as the culmination of the entire MCU to date, there was a lot to cover. Plus, the filmmakers admitted they didn’t want to short-change the “emotional moments” that they promise will be an intrinsic part of the story. So, buckle up, kids, because it looks like we’re in for 3 hours of Avengers: Endgame when it finally arrives on April 26th.